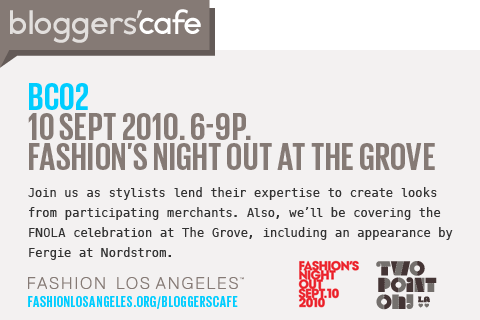 Last year Fashion’s Night Out Los Angeles paled in comparison to FNONY. Neiman Marcus in Beverly Hills put on a pretty sweet bash and Fred Segal did too, but that was about it. This year L.A. is on the ball with over 200 retailers participating in the night’s festivities. Neiman Marcus will also host in-store events at their various locations http://www.neimanmarcus.com and Fashion Island’s (Newport Beach)events will run from 5 – 9 p.m. Shoppers will receive a Fashion Island Custom Tote. Westfield Century City is rewarding those who spend $200 with a $40 Westfield gift card and access to the Fashion Lounge, which will be showing a screening of Lagerfeld Confidential complete with bites from Pink Taco and wine courtesy of Malibu Family Wines. Other fashion-focused communities will also host special sales and in-store events from 6 – 10 p.m. The shops on Melrose Avenue from Fairfax to La Cienega, Abbot Kinney in Venice, Los Feliz (Sunset to Los Feliz, Vermont to Hillhurst), Sunset Plaza, and the Cooper Design Building in Downtown are but a few. Have fun fashion lovers! Get out there, support the community, and shop till you drop.